For more details click the T&F button above. William St Coach Park. Bring your own mat. Parkruns at Sewerby & Dalby. Register at www.parkrun.org and print barcode. The Thursday 6-00 Improvers Group enjoying the sunshine above Scalby Mills. The next Coach is Beverley on 12th May. Contact David Field as soon as possible so we can determine size of Coach. The usual arrangements for Sunday lunch at the Sun Inn are in place. Contact Harry by text or email only with your name, choice and size of meal. 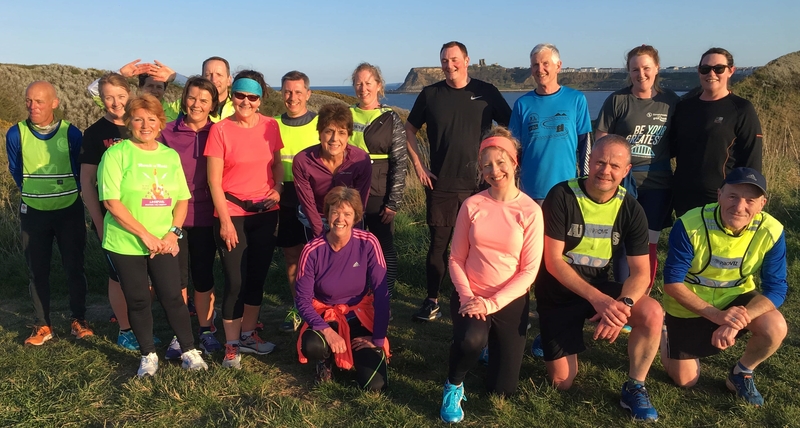 Jayne and Gill have started an absolute beginners Walk to Run Group on Monday evenings at Scarborough Rugby Club. Click HERE for all details. Sport England’s Clubmark is a cross-sport accreditation for sports clubs with junior sections in recognition of a quality club. Follow this link for essential information for Junior parents/carers, coaches and volunteers. To access membership details, click the green button below. 20% Discount on Pro-am physio services for SAC members. For seniors over 16 years of age, younger athletes by invitation only. 3/4 groups (one off-road) of different abilities/levels led by qualified Run Leaders. From 3 miles to 6 miles. Meet at 18:50 for results and announcements. £1 per session to cover costs. Junior SPORTSHALL and Track and Field training. £1 per session for members, £3 for non-members, to cover cost. Normal run from Rugby club with David. Runs start at 7pm for about 1 hour. Hill or Speed work training. on site content, material and any errors that you spot.